Sushi Saito is a 3 Michelin Star sushi restaurant, and many regard it as the best in Japan. We got to spend the day with Saito, to ask him about his work, and to eat his soul shattering sushi. In this video Master Sushi Chef Hiro Terada shows you how to fillet a whole Scottish Salmon with ease. The main thing is to of course start with a very sharp knife. You’ll also need a pair of tweezers that can remove the bones that are still set in the meat once you remove the main bone that’s down the center. One important thing that we don’t show here is when Chef Hiro removes the scales from the fish. It’s a simple process using a fish scale remover. Just use the tool and from from tail to the head in a consistent motion until there are no more scales. 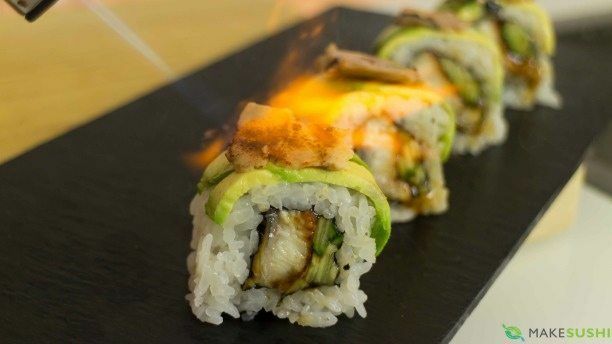 Learn how to one of the most expensive sushi rolls you could ever make a home. In a bowl wash the rice 3 times with water. In a pot add rice and water and cover and bring it to boil. Reduce heat and simmer for 10 minutes. Then take off heat and rest for another 15 minutes. In a microwave safe bowl heat sugar, salt and vinegar for a minute or until the sugar is completely melted. Transfer the rice onto a serving bowl and pour the vinegar over the rice. Using a spatula fold in the vinegar and cut into the rice. Have another person fan the rice while mixing to get it down to room temperature. Prep the fix-ins. Slice tuna and chop until the meat is mashed together. Transfer into a small bowl. In a medium bowl marinate chicken with your favorite teriyaki sauce. Fully cook chicken and slice and set aside in a bowl. Cut imitation crab into small pieces. Mix in mayonnaise until fully coated. Set aside. Cut veggies into thin slices. Cut avocado into bite size pieces as well. Set up the table: After placing your rice and fix ins place each sushi rolling station with a bamboo rolling mat. Set a side of water bowl so rice does not stick to your hands. Have a cutting board close by as well as a knife. Let’s roll. On the rolling mat place one sheet of nori. There is a smooth side and a rough side. The rough side will face up. Place the fix in at the bottom row of the rice. Grabbing both nori and the mat roll the mat over so the extra space at the bottom touches the other side. Squeeze down to make a nice tight roll. Grab the mat and continue rolling over the rice until your roll is complete. Squeeze down along the way to keep the roll from holding its shape. Transfer your roll onto a cutting board. Have a damp towel close by for your knife. Before you cut give you knife a wipe. This will prevent the rice from sticking to the knife. Cut your roll into desired sizes and enjoy!!! Remember sushi is finger food so it is OK to eat it WITH YOUR HANDS! Think that world over sushi is intimating and overwhelming, here now a quick and handy guide to understanding the basics. Pro tip: Sashimi isn’t sushi. Eater is the one-stop-shop for food and restaurant obsessives across the country. With features, explainers, animations, recipes, and more — it’s the most indulgent food content around. So get hungry. Cody Auger, chef/owner of Nimblefish in Portland, Oregon, breaks down 11 whole fish and turns them each into a single piece of nigiri. 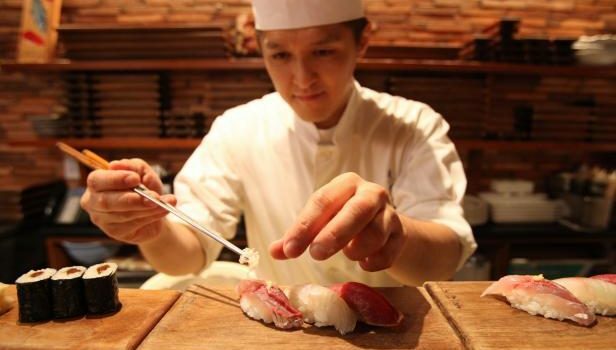 Watch as he scales, fillets and prepares Red Sea Bream (Tai), Threeline Grunt (Isaki), Golden Eye Snapper (Kinmedai), Young Gizzard Shad (Shinko), Sardine (Iwashi), Horse Mackeral (Aji), Trevally Jack (Shima Aji), Yellow Striped Butterfish (Takabe), Beltfish (Tachiuo), Bigfin Reef Squid (Aori Ika) and Bigeye Tuna (Maguro). He also demonstrates how to make Tomago, a Japanese egg omelet.